Opening a restaurant is almost as hard work as running one. Some restauranteurs take a long-winded path to opening their own premises, either by choice or necessity, starting off with a street food stall before moving on to pop-ups and eventually their own permanent patch. The Wild Game Co is somewhere close to the end of that journey with their Charlotte Street restaurant which has been ambiguously described by some as ‘semi-permanent’ and a ‘long-term pop-up’. Kitchens sometimes have trouble moving from a street food/pop-up menu to something more permanent, often failing to evolve their offerings, but that’s not the case here. 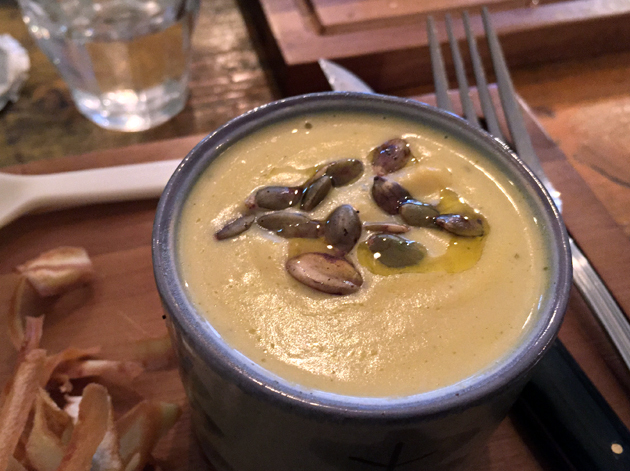 The Charlotte Street menu is short but noticeably different from the one at its previous pop-up at The Endurance, consisting of a few burgers, salads and steaks with the occasional special. Most of the menu is also available for take-away, with only a handful of dishes eat-in only, and you can even buy some of the raw meat for use in your own cooking at home. 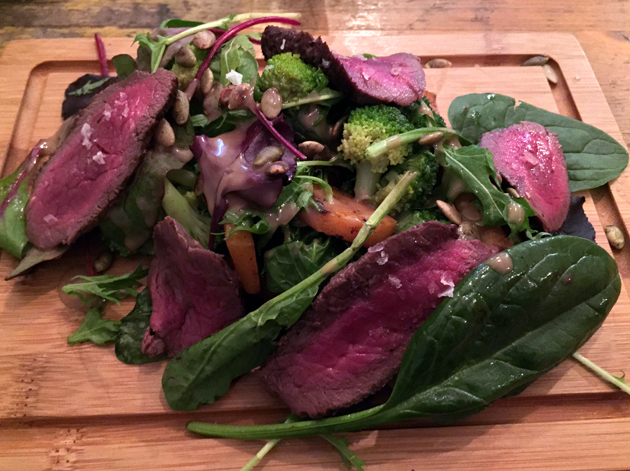 Although billed as a venison carpaccio salad, the tender, rare slices of deer served at room temperature in this salad were far thicker than any carpaccio I’ve encountered before. 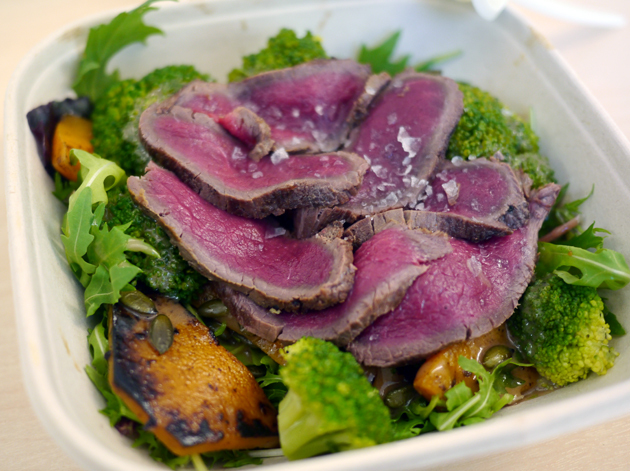 Nevertheless, the tender, hearty slices of meat went well with the sweet squash, firm broccoli and nutty pumpkin seeds that made up the salad base. No deep fried Mars bars here. 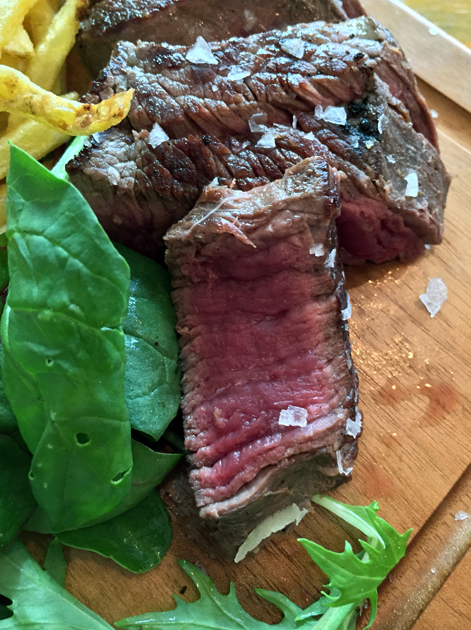 A variant of this salad substitutes the carpaccio with thicker slices of steak. A light sprinkling of salt compliments the dense, slightly chewy venison well, while the squash was a little sweeter than it was in the salad above. 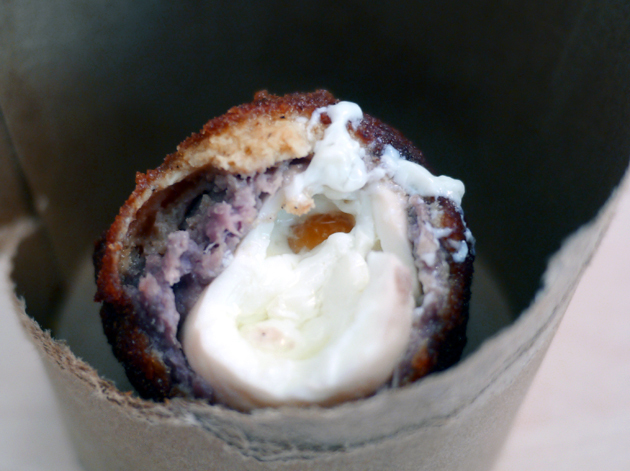 If the scotch eggs are available, then you should grab one or three. The crisp breadcrumb coating was a little too oily for my liking, but the thin yet meaty layer of diced venison immediately underneath more than made up for this. Even better was the runny, soft boiled egg at the centre. Although the yolk wasn’t quite as rich as I was expecting, this was still a cracking Scotch egg. Egg in a cup race. The Wild Game Co’s version of stovies is a very homely, warming pot of well-done comfort food. 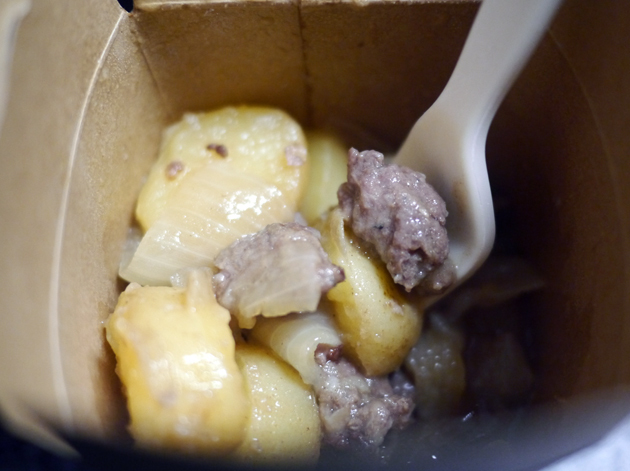 Small but meaty balls of venison were accompanied by soft potatoes and tender, sharp onions. The entire lot was served in a small amount of meaty, moreish broth that I could quite easily slurp from a glass all day. Although there was precious little feta to be found in the beetroot, feta and kale salad, the other quality components of this dish made up for its absence. 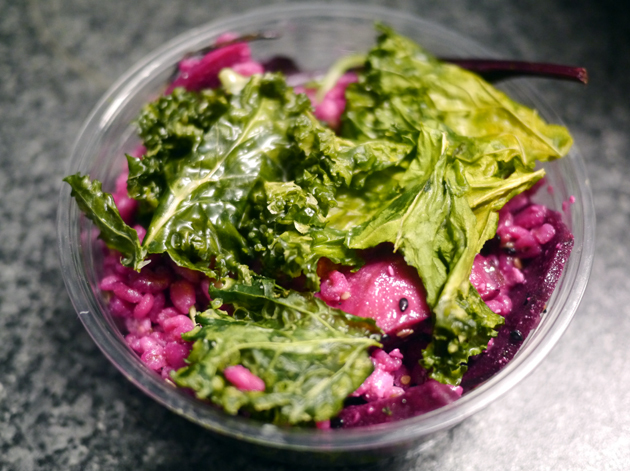 The crisp, almost seaweed-like leaves of kale and the tart pickled beetroot were accompanied by nutty, oaty grains that went down a treat. It’s a salad for people who hate salads. Yes, they eat vegetables in Scotland. No, really. 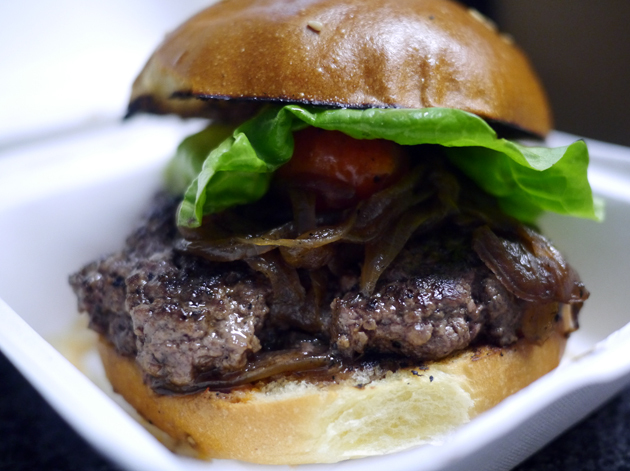 The Wild Game Co’s venison burger was better than ever. 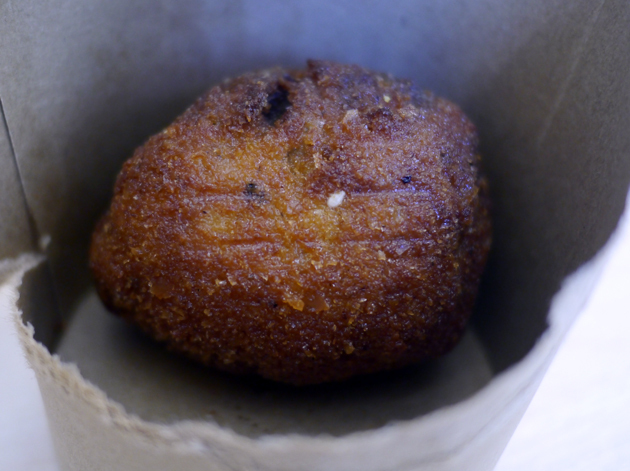 The patty was a touch dry, but also dense, meaty and chewy with a mildly coarse grind. The entire was thing was held together by a bun that stayed out of the way and a minimum of superfluous toppings. What sound do deer make? A whiney braying perhaps? 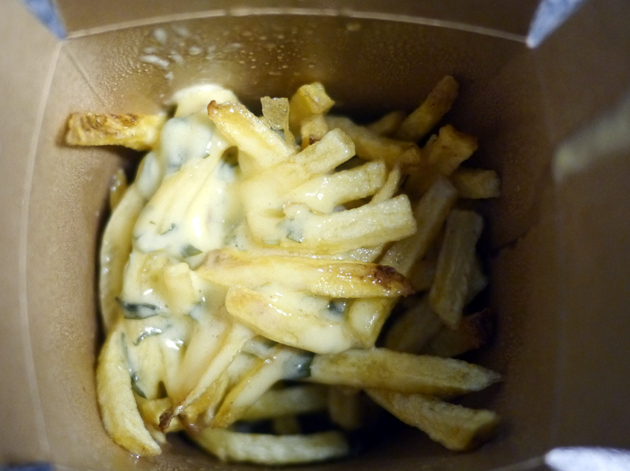 Disappointingly for a kitchen allegedly manned by Scots, the chips were more like fries. Thin, floppy and a tad leathery, only the buttery, herby béarnaise sauce spooned on top made these carb twizzlers edible. Thin, floppy and a tad leathery. Much like your mum’s naughty bits. 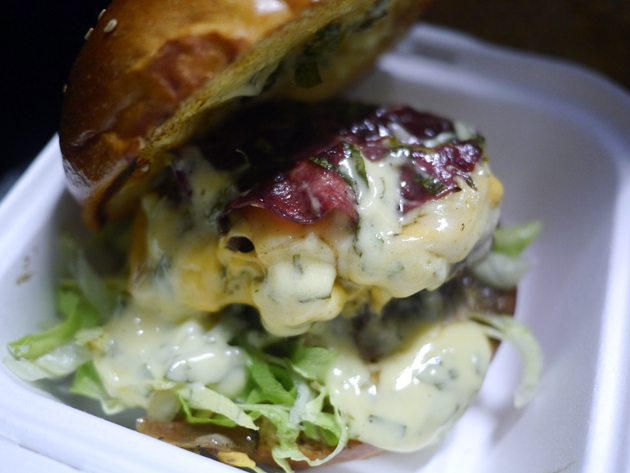 You can, if you’re some sort of uncultured brute, order a combined beef and venison burger. In any case you’re probably not missing anything given the so-so nature of the beef patty in the beef-only burger. Cooked medium, the patty was was dry and bland with some useless shreds of lettuce and surprisingly tame bacon thrown in. The sweet onions and musky, earthy, gooey cheese helped redeem this so-so burger, even if the melted cheese did have a tendency to drip everywhere. At least the lightly charred bun had the decency to stay out of the way. Worryingly, the feta, beetroot and kale salad was noticeably worse than the first time around. There was some lame feta, but no kale in sight. 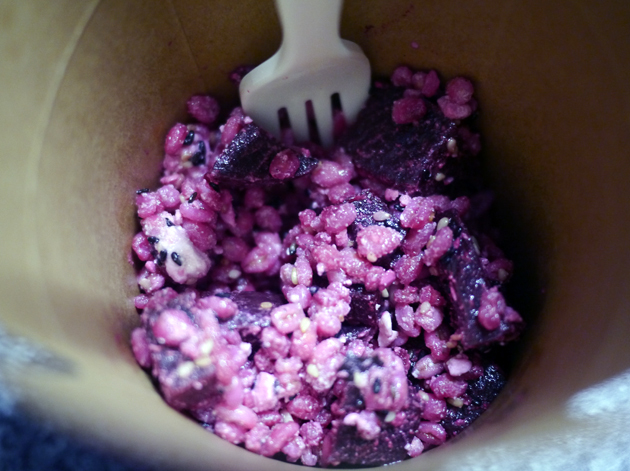 The beetroot was less pickled and more earthy, while the grains were surprisingly bland. Such a dramatic wobble in execution is very worrying. 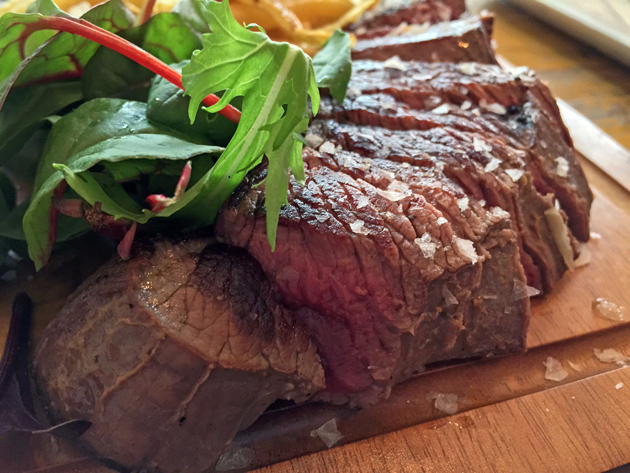 If you’re hoping for a huge slab of flesh in the steak frites, then you’ll be disappointed. Once you’ve put aside your unreasonable Angus Steakhouse gripes aside, then you’ll likely enjoy the sensibly sized portion of slightly chewy, dense and earthy venison steak slices cooked rare just as much as I did. 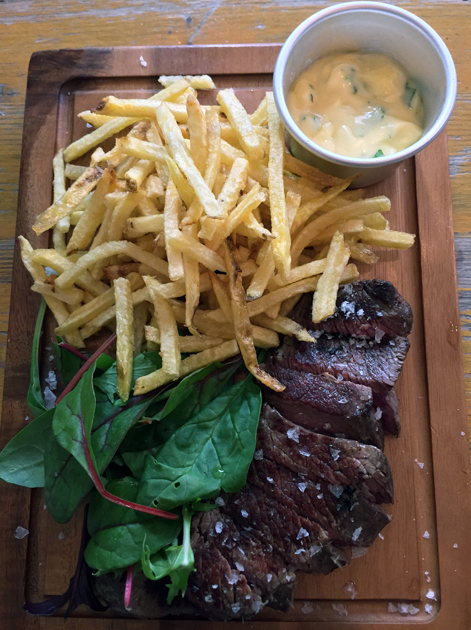 It’s therefore a shame that the ‘chips’ were just as disappointing as before, relying once again on the béarnaise to carry the day. How much money did these guys spend on chopping boards instead of plates? Steak is an anagram of Keats. Coincidence? Well, of course it is. Duh. The pumpkin soup was creamy and warmed my cockles, but lacked the characteristic sweetness I was expecting while the crisp, slightly chewy squirls of fried parsnip added little. The only dessert that was available on any of my visits was the brownie which sadly had the bitter tang of cheap, low-grade chocolate to it. Far better were the accompaniments of chewy, hearty oats and a light cream flavoured with a gently sweet honey that had a mild flowery scent to it. 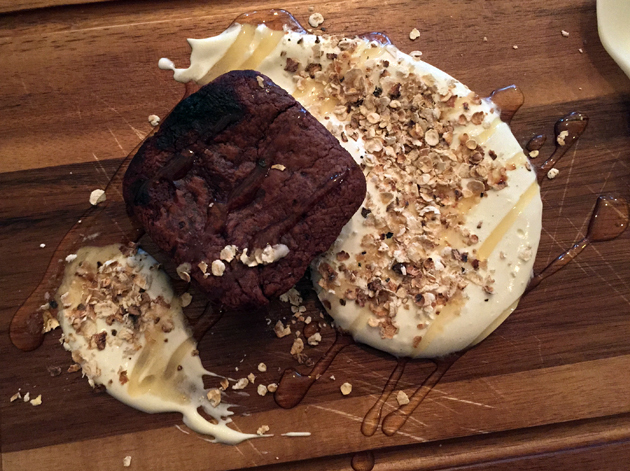 The oats, cream and honey go together extremely well and could easily form the basis of a far superior brownie-less dessert. Brownies were also a weird bunch of short drunken people in Willow. Fact. Every neighbourhood needs a restaurant like The Wild Game Co. A casual atmosphere plus inexpensive, generally high quality dishes – most of which can be had as take-away too. Although not everything was perfect with several missteps, The Wild Game Co more than deserves its own permanent home and I hope they find it soon. Opening Hours: Monday-Friday 11.30-22.00; Saturday noon-22.00. Closed Sundays. Average cost for one person including soft drinks: £10-15 approx. Tags: burger, chips, london, restaurant, review, salad, scotch egg, steak, stovies, venison, wild game co. Bookmark the permalink.